The Newark Odinist Temple was consecrated on Midsummer's Day 2014 as the first heathen Temple in England for well over a thousand years – and we hope and pray that it will be the first of many to come! The Temple was acquired for the use of the Odinist Fellowship, a registered, religious charity. As Odinists, we practise and perpetuate England's native and national faith, which is the original, Old Religion of the English people. All our services are open to the public, and we welcome visitors at our rites, even if they merely wish, without commitment, to attend and observe. We also aim to encourage visitors by holding 'open days', when tourists, pilgrims or members of the local community can call in, either to pray or to ask questions about the faith, or just to enjoy the stunning pagan art collection and historic architecture. Despite many centuries of persecution the Odinists of England are now a growing, albeit still small and widely scattered, faith community. It has been our ambition for many years to re-inaugurate a national network of Odinist Temples throughout the land. The acquisition of our first such Temple, which was obtained after many years of sacrifice by our faithful supporters, therefore represents a great stride forward for Odinism. We now believe that it will serve as a showcase for the religion and help to stir up among our people a greater interest in the ancient spiritual heritage of this land. The Temple has been described as 'a little gem'. It is a small, but beautiful, edifice close to the centre of the historic market town of Newark-on-Trent, Nottinghamshire, in the English Midlands. A Grade II Listed, stone-built building, it dates from the Tudor period and contains many original features, such as its chamfered doorway and mullion windows. The first reference to it is to be found in the will of William Phillipot, the almshouse benefactor, dated 1556 in the reign of Mary I. This makes it the second-oldest ecclesiastical building in Newark. 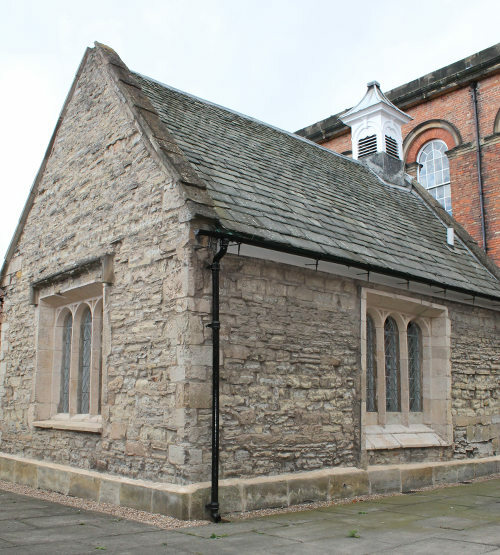 Originally used as an almshouse chapel, when it was known as the Bedehouse Chapel, in 1980 when the old almshouses were redeveloped, the building became for a number of years a volunteer centre, before falling into disuse and decay. When the Temple was acquired by the Odinist Fellowship in 2014, a major restoration programme was carried out in accordance with the best conservation practices. Now, fully refurbished and refurnished, with its specially commissioned set of paintings depicting a number of our Gods and Goddesses, the Newark Odinist Temple has, at last, come into its own. This may explain why many today are examining our ancestral faith, the beliefs that flourished here among the Anglo-Saxons before the arrival of the first Christian missionaries. It is a religion, which though ancient, expresses far more clearly the spirit of the modern age, and is more in tune with contemporary thought and learning. So what is Odinism? In olden days, when the world was younger, our forefathers honoured and worshipped many Gods and Goddesses. They offered their prayers and sacrifices to different deities for different purposes: there were Gods of peace and Gods of war, Gods to assist the farmer secure a good harvest, and Gods to aid the warrior in battle. For help in childbirth Frigg, the queen of the Gods, might be invoked; in matters of the heart and love matches, Freya; and for rainfall in times of drought, Freya's brother, Frey; for protection from thunder storms, red-bearded, hammer-wielding Thor; for wisdom and magical knowledge, Odin Allfather, the chief of the Gods. This religion, or spiritual belief system, which we now call 'Odinism', flourished before the arrival of Christianity in the north of Europe among the ancestors of the English: the Angles, Saxons and Jutes; but also among the many closely related tribes and nations of the Continent: Frisians, Franks, Hessians, Swabians, Thuringians, Marchmen, Burgundians, Danes, Swedes, Geats, Norsemen, Goths, Lombards and Vandals. In short, we are talking about the original and earliest religion of the Northland. Our heathen, pre-Christian ancestors were not, as is sometimes imagined, uncouth barbarians without refinements or morals. On the contrary, not only did they prize the skills of poets and craftsmen, but they also extolled a noble and demanding code of ethics that gave its name to the Heroic Age. 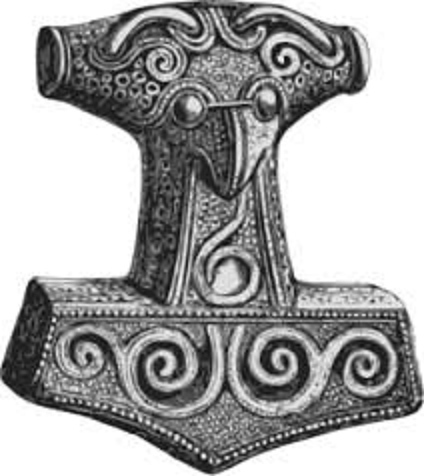 We Odinists today encapsulate it as the Nine Noble Virtues: Courage, Truth, Honour, Hospitality, Fidelity, Discipline, Self-Reliance, Industriousness, Perseverance. If any of this strikes a chord with you, and if you too are a seeker after the truth, then, Friend, read on, and perhaps you will discover, as so many of us have done already, that without even realising it, you too are an Odinist! © Odinist Fellowship | 2019 - The Odinist Fellowship is registered with the Charity Commission as a religious charity under charity number 298688.